The transition from summer to winter is a time of glorious abundance. From fruit trees groaning with apples to hedges ladened with nuts and berries – at this time of year nature’s pantry is fully stocked! You can enjoy this plenty at home too, by planting edible garden boundaries and hedges that serve up lots of tasty fruits to pick. Edible boundaries aren’t just attractive, they’re a boon for local wildlife and great for us gardeners, promising lots of fruits and nuts ideal for filling pies, making country wines and as a source of ingredients for all manner of jams, jellies, chutneys and other store cupboard treats. Fall is a great time to plant new trees, shrubs and fruiting canes, or you can wait till spring if winters are severe where you garden. Fruit trees trained to hug walls or fences are a great place to start. Apples, peaches and pears may be grown as fans (where the branches radiate out from a central trunk), as espaliers with parallel branches, or single-stemmed cordons, which enables you to grow lots of different varieties in a smaller area. Walls that face the midday and afternoon sun will help to ripen fruits to perfection. Prioritize the sunniest surfaces for warmth-lovers such as figs. There’s a fruit tree for every situation. As well as along boundaries, you can train fruit trees on free-standing post-and-wire supports so you can use them to divide up areas within your garden while enjoying their luscious, juicy fruits. Some fruits such as grapevines love to sprawl. Provide them with strong, sturdy supports and they’ll soon cover a boundary wall with spectacular speed. Grow your own grapes then try your hand at wine making! Kiwi fruits are another rapid rambler. If you only have space for one kiwi, plant a self-fertile variety to guarantee the delicious fruits. Many berry-bearing plants grow into naturally unwieldy shrubs or unruly thickets of canes. But these too may be trained to sit snug against a wall. From fan-trained redcurrants to wall-hugging blackberries – choose wisely and your edible boundaries can be a well-ordered joy. Did you know, for example, there are virtually thornless varieties of gooseberry, or that the humble blackberry is the parent of many different hybrid berries, such as the loganberry? Many of these fruits can be found in our Garden Planner. Simply select ‘Fruit and Nuts’ from the selection bar drop-down menu then scroll through the selection bar to find what you’re after. When you add the plant to your plan, the grey-colored area surrounding it shows you the space it needs so you can see exactly how many plants you can fit in without overcrowding. For more unusual fruits, select one of the generic fruit types – bush or trellised – then double click on it to bring up the Varieties box. You can then select a variety from the drop down list, or create your own variety, customizing its spacing if required. To truly mimic nature’s seasonal bounty try planting an edible hedge. Many autumn-cropping shrubs may be planted to create a varied and beautiful hedge. Include a rowan (a.k.a. mountain ash) for its Vitamin C-rich berries that can be used to make a fine jelly to accompany meats. Plant a rambling rose or two for their rosehips; or elder for its flowers and berries that are prized by home wine makers. 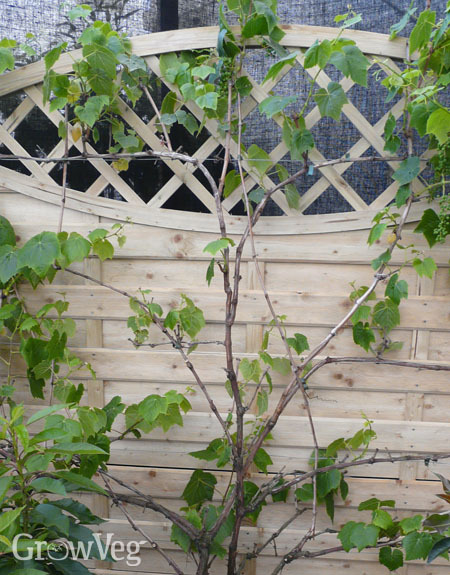 Hazel is useful both for its nuts and stems, which can be used for making plants supports and wicker hurdles. And don’t forget crab apples, which are high in pectin so are great for jam-making. If your hedge needs to keep out animals (or people), grow spiny blackthorn which produces dusky sloes – the key ingredient to that warming winter tipple, sloe gin. Or how about hawthorn for its fresh new leaves and flowers – a pretty springtime salad topper – and its end-of-season berries, great in a satisfying fruit leather? Match hedgerow plants with similar growth habits and pruning requirements so that one species doesn’t become over-dominant. Young transplants may need watering in their first year to help them establish. These are just a few ideas to help make the edges to your garden every bit as productive as all the vegetables and fruits growing within it. If you’ve got a suggestion for other edible hedgerow plants or boundary fruits, please tell us about them in the comments section below. "I would like to subscribe." "Hi Stefica. To subscribe to the Garden Planner please click on Create an Account at the top right of this page. If you require any assistance or have any questions about using the Garden Planner at any point, please click on Contact in the menu bar at the top of the page to get in touch with us, or use the contact form in the Garden Planner. Customer support is available 7 days a week by email, and we're always happy to help."